The threat of the workhouse and the Poor Law loomed large in Victorian society. People of almost all classes might find themselves poverty-stricken or destitute through the inhumanities of the capitalist economy, or through illness, personal tragedy and the host of other threats people experienced in a society with no other form of social security. The migrant Irish were particularly vulnerable to these dangers and many ended up in the workhouse, or dependant on outdoor relief, for part of their lives. Many died in those unforgiving wards. This research on Irish families in Victorian Stafford has not particularly concentrated on their interactions with the Poor Law system. Indeed, one of the outcomes of the project has been to document the diverse life outcomes of the immigrants and their descendants. The stereotypical image of the Irish poor in the wreaking slums has been modified, though by no means dispelled. This blog focuses in, however, on some of the evidence we do have about the Irish and the Stafford Workhouse. Stafford’s Workhouse was built in 1837-8 on the northern edge of town up the Marston Road. It was designed by local architect Thomas Trubshaw and followed the cruciform plan laid down by the Poor Law Commissioners in 1835 after the 1834 Poor Law Reform Act. Thousands of Staffordians passed through its forbidding walls for over a hundred years. 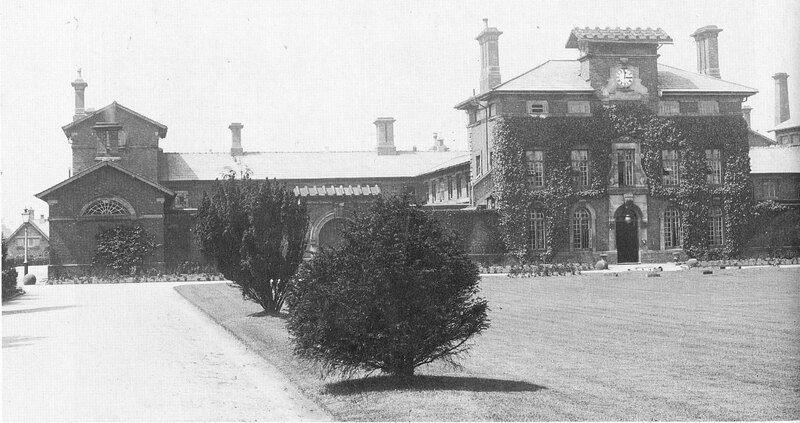 In 1948 it finally metamorphosed into Fernleigh, an old peoples’ home and hospital for the chronically sick. It still carried, nevertheless, the stigma of the Workhouse and I well remember my gran speaking of the place with pity and foreboding in the 1950s. It was finally demolished in the early 1970s. Stafford Workhouse, built 1837-8, demolished in the 1970s. The history of the Irish in Stafford shows that the Workhouse carried out a range of functions down the years. Firstly, it accommodated countless numbers of vagrants, tramps and destitute migrant workers both before and after the Famine. In 1871, for example, it was reported that 7,000 vagrants (all of them, not just Irish) had passed through the Workhouse in the previous year, a steep rise in numbers since 1864 when the number had been 2,500. Many Irish seasonal workers and vagrants were amongst these ‘inmates’ and the Poor Law Guardians were always anxious to make the accommodation in vagrant or casual wards as unpleasant as possible to stop people, as they saw it, using the Workhouse as free board and lodging on the way to somewhere else. It was frequently alleged that groups of Irish sent the money they had earned from farm work back to Ireland with one of their number whilst the others claimed destitution and were admitted to workhouses on the way home. A ‘temporary detached building’ was built to separate the Irish from other Workhouse inmates. By July the fever wards were full and in the chaos the Irish were all crammed in together – the sick, the dying, the apparently well, those relapsing into fever and the convalescent. The Workhouse only took in those who were ill or had nowhere else to go. It was a refugee camp for the absolutely ill and destitute, and the parallels with current refugee crises are stark and by no means in favour of the modern age. For example, at the height of the Famine, on 18 October 1847, William Coleman (b. 1805) was stricken with fever and taken into the Workhouse. He was there for five weeks. This is the first record of a family which later become well established in Stafford. William Coleman farmed a small patch of land that family legend believes was in Knock, Co. Mayo. Like many families stricken by the Famine, William had probably come to Stafford in a desperate attempt to earn money to save his family from the loss of their land. He may already have known the place from earlier seasonal work or from contacts who did. His wife and children were not with him in 1847 but they had arrived by 1851. Catherine Coleman and four of her children were then living in Margaret Morris’s lodging house at No. 9 Sash Street, although William was not present and nor were three of his children. They seem not to have been in England at all, so perhaps they were still clinging to the land back in Mayo. Whatever the reasons, this staggered arrival in Stafford shows how family settlement could be a drawn-out process which ironically began in the Workhouse. During the Famine the Workhouse could have become, however, a general holding centre for refugees being deported back to Ireland – again with parallels to the present day. It did so for one family – the Kellys. James and Jane Kelly came from Co. Mayo and their arrival in Stafford during the Famine is documented in some detail. This was because, uniquely, the Poor Law authorities tried to deport them back to Ireland. The first definite record of the family is on 10 July 1847 when the Relieving Officer, Edward Brannington, applied for 2s 1d for Jane Kelley (sic), ‘an Irish pauper’. A ‘Thomas Kelly’ had already been admitted to the Workhouse on 29 June, however. He came in because of illness. He was so ill that he was removed to the Infirmary on 1 July. ‘Thomas Kelly’s’ recorded age tallies with that of James, and they were in fact one and the same person. Jane and her eight year old daughter Mary were destitute because of James’s illness, and this would explain why she got outdoor relief. A week later she had received £2 3s 2d, and on 7 August she got another £1 1s 2d, with a further 2s 5d on 21 August. The Poor Law authorities were struggling to cope with the Famine Irish and the Guardians started to panic at the cost. On the same day that Jane Kelly got her final payment the Guardians resolved ‘that the Act to amend laws relating to the removal of poor persons from England (10 & 11 Vic. Cap. 33) be put into force under the direction of the Overseers of the several parishes of the Union’. The destitute Irish were to be deported back to Ireland. In practice the authorities in Stafford proved reluctant to implement the procedure and the Kellys became a test case. On 24 September 1847 James Kelly was again admitted to the Workhouse because of illness. The authorities refused to give Jane any more outdoor relief, and she and her daughter were forced inside as well. In effect they were imprisoned there before the next move. The family was discharged on 17 October and an order made for their removal from the parish – and England. A month later came the reckoning. On 13 November Brannington presented his bill of £4 4s 9d ‘for conveying three Irish paupers – James Kelley, Jane his wife and one child – to Liverpool and the amount of their fair by steam packett to Dublin’(sic). At this point the Guardians refused to pay up. They thought the relieving officer had exceeded his powers and that the expenditure was too high. They passed the bill to the parish overseers of Stafford with the excuse that the Kellys were chargeable to that parish. The overseers there refused to pay and passed the buck back to the Union. Two weeks later Brannington presented his bill again together with the Order of Removal. This time the Guardians questioned the legality of the Order but cravenly decided to seek guidance from the Poor Law Commissioners in London. The Commissioners’ ruling does not survive, but the matter surfaced again on 22 January 1848 when Brannington was cross examined over his actions in the Kelly case. The Chairman supported the relieving officer, arguing that ‘Birmingham and other places were removing great quantities of Irish …. and Stafford must do the same’. The other guardians were not convinced and they did nothing. There is no evidence that the Stafford poor law authorities removed any more Famine Irish from the town. They decided it was too much trouble. The Kelly family had, in the short term, been the unlucky victims of a failed experiment. They had the last laugh, however. Although Brannington claimed for their boat fare to Dublin, the family either slipped the net in Liverpool or got the first boat back from Ireland. They returned to Stafford. We know they were back in the town by 1848 because their son Martin was baptised at St Austin’s in October of that year. They went on to become a family with a fairly notorious reputation in the town. After around 1849 conditions in and around the Workhouse in Stafford became more ‘normal’ with the decline of the immediate Famine crisis, though Irish immigration resulting from it continued at a high level into the 1850s. The next blog will look at the roles played by the Poor Law system in Stafford in relation to the Irish in the decades after 1850. Staffordshire Advertiser, 23 September 1871. Staffordshire Record Office (SRO), D659/8a/4-5, Stafford Poor Law Guardians, Minute Book 1844-1848 (7 July 1847). SRO, D659/8a, Stafford Poor Law Union Board of Guardians Minute Book, 29 May 1847. SRO D659/1/4/8, Stafford Workhouse Admission and Discharge Book, 24 September 1847-30 March 1850. The late Peter Godwin, 2002, and Kathleen Boult, descendants, 2003. In 1852 William Coleman was described as a ‘husbandman’ on his daughter Catherine’s marriage certificate. SRO, D659/8a/5, Stafford Poor Law Union, Board of Guardians Minute Book, 17 April 1845- 3 February 1849. SRO, D659/1/4/7-8, Stafford Poor Law Union: Workhouse Admissions, 1847-8. SRO, D659/8a/5, Stafford Poor Law Union, Board of Guardians Minute Book, 17 April 1845-3 February 1849, 13 November 1847. The full history of the Kelly family is covered in my book: John Herson, Divergent Paths: Family Histories of Irish Emigrants in Britain, 1820-1920, (Manchester, Manchester UP, 2015), pp. 113-122.